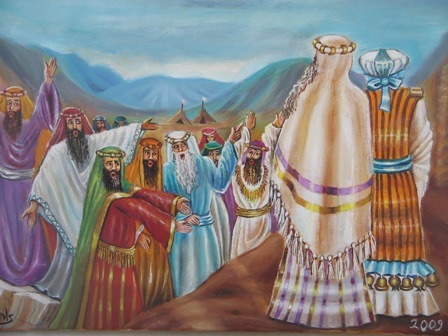 The Maharal in explaining Rashi in this week’s Parsha opens our eyes to a new insight in the events concerning the marriage of Yakov first to Leah and then to Rachel. Rashi writes that Yakov explains to Yosef why he buried Rachel on the road. It was done according to the command of HaShem. When Klal Yisroel will go into Galus, Rachel can cry and request mercy, and HaShem will answer her. The Maharal explains the depth of that Rashi, and I would like to try to extract some ideas from this. Yakov is called by Chazal, “A small-scale of the image of Adam”. Adam was the ultimate Tzelem Elokim – form of God, and Yakov was a scaled down version of that Tzelem. Therefore, Yakov throughout his life attempts to bring the world back to the perfection of Adam before the sin. In the beginning of Parshas VaYeshev, Yakov desires to dwell in tranquility. HaShem says, “It is not enough for Tzadkim to have that in Olam HaBa, they also desire it in Olam HaZeh!” Why does HaShem seem to not want Yakov to have his reward even in this world? In various Sefarim it is explained that Yakov believed that he had completed all the efforts needed to bring the world to its completion, and that now he could be on the level of Olam Haba, which is to dwell in tranquility. But even though he was correct and had accomplished what he was supposed to as an individual, Klal Yisroel still needed to accomplish their tasks. Therefore, he could not dwell in peace and bring the world to the level of before the sin. Klal Yisroel still needed to go into the Galus in Egypt, and through that reach completion. And Yakov needed to go through the events of Yosef to bring that into fruition. The idea that Yakov is like Adam before the sin is found in a number of sources. The Brachos that Yakov receives from his father are about the land being fruitful. This is an example of the world returning to a pre-Gan Eden state. Therefore, when he leaves his father’s home, Yakov is sure that since he has received those Berachos, the world has reached perfection, and he only needs to actualize it. In the world-view of the Maharal, complete perfection is a state of complete unity. Any dispersion or separation is only a result of the sin of Adam. We can explain this in the following way. Adam and Chava were a unity. They were created as one, but back to back. The only Avoda they had was to rejoin face to face in a complete unity, as opposed to back to back. If they had, then the world would have been complete. Since they allowed the snake to intrude upon this unity, that connection did not take place, and the entire world became a place of separation. The rest of the history of the world is an attempt to recreate that unity that was lost. When that happens, it will be the era of Moshiach, the bringing of the world to the state that Adam and Chava were supposed to bring it to. The Maharal explains that the Pasuk about the rivers emanating from Gan Eden represents this idea. From the unity of Gan Eden emanates one river, which separates into four rivers. The one river is the kingdom of HaShem which is the unity. The four rivers represent the four kingdoms that diverge from recognizing the unity of HaShem. This is the separation that Adam was supposed to preclude from taking place, by joining together with Chavah in the correct way. Yakov, as the choicest of the Avos, presumes that he can create the unity that the world is lacking. When Yakov returns to Eretz Yisroel he desired to dwell in peace. This was not a desire to relax and sit back. He knew that Klal Yisroel needed to go through encounters with other nations to reach their completion. But he thought that after he had gone through all the battles with his various adversaries he had accomplished what the world was supposed to, and now Mashiach could come. That is his desire to dwell in peace. As we see, he was mistaken in this, but that was his goal. We can possibly explain that after Yakov receives the Berachos he thought that this approach was also true. Since he had received the Berachos of his father, he thought he had reached the level of a unified Gan Eden. As a result, he thought that just as the marriage of Adam and Chavah was to create unity, his marriage to Rachel, would create the same. He thought that he would marry only one wife, have all the Shevatim through her, and create the unity through his efforts. But Rachel knew this was not to be. As Rashi says, all the Imahos were Neviot. They knew there were to be twelve Shevatim. As the Maharal writes, Rachel knew that there would another wife. Rachel decided that if this had to happen, then better she should accept it with love on her terms, than against her will. Rachel being aware of her father’s machinations, accepted that the other wife should be her sister, and with her acquiescence. The division in Klal Yisroel between the leadership of Yehudah from Leah, and that of the sons of Rachel; is not just an accident of history. That divide is the internal separation in Klal Yisroel that parallels the division in the world since the sin. This is what hinders the arrival of Moshiach. Only when that is resolved can the final Geulah arrive. Therefore, just as there are four rivers that come out from Gan Eden, and they need to be resolved; so too there need to be wives of Yakov to accentuate this division till the time when we can overcome it. But Rachel creates a remedy before the affliction. Since Rachel accepted this with love, these are the seeds for reconciliation. This lays the foundation for the ultimate reconciliation between the house of Ephraim and the house of Yehudah, as taught in the Haftorah of the previous Parsha. To take this idea one step further, if complete separation in four directions is represented by the four rivers leaving Gan Eden, there need to be four wives. So Rachel and Leah brought in their maid servants into the house of Yakov, rather than once again allowing a foreign body to be brought in. Therefore, in the house of Yakov itself, there is a fourfold division. In Klal Yisroel’s history there are times when this unity is apparent. At the beginning of the birth of the line of Moshiach, in the book of Rus, we are told that the community blessed Boaz that Rus should be as Rachel and Leah. What this means is that she should be the unifying force that through her Klal Yisroel can reach completion. And Chazal saythat here the children of Yehudah the son of Leah by mentioning Rachel first, are acknowledging the supremacy of Rachel and beginning this process of unification. This is because this moment is the beginning of the idea of Moshiach, which is to create that unity. There is also one time in Klal Yisroel’s history when there is complete unity. That is under the reign of Shlomo. There is a Bais HaMikdosh where everyone serves HaShem, and all twelve Shevatim are under one king. That only remains for a short time. When Shlomo dies, two things happen. The kingdom splits, and Klal Yisroel begins to serve Avoda Zara. Based on what was explained above, these are not two separate ideas, but emanate from the same disunity in the world. Our goal is to recreate the unity in both realms, and bring Moshiach. There is one other important lesson to learn from Rachel. As we look at the world, we cannot change the cards we are dealt, we can only decide how we will play them. She did that, and laid the foundations for the imminent arrival of Moshiach. רש”י על בראשית פרק מח פסוק ז – ואקברה שם – ולא הולכתיה אפי’ לבית לחם להכניסה לארץ וידעתי שיש בלבך עלי אבל דע לך שע”פ הדבור קברתיה שם שתהא לעזרה לבניה כשיגלה אותם נבוזראדן והיו עוברים דרך שם יצאת רחל על קברה ובוכה ומבקשת עליהם רחמים שנא’ (ירמיה לא) קול ברמה נשמע וגו’ והקב”ה משיבה יש שכר לפעולתך נאם ה’ וגו’ ושבו בנים לגבולם. ספר גור אריה על בראשית – פרק מח פסוק ז – ואם תאמר ולמה רחל בוכה יותר משאר אמהות, ובמדרש איכה רבתי (פתיחתא סוף אות כד) אמר שם לפי שרחל אמנו אומרת להקב”ה מה עשו בני שכך הבאת עליהם פורענות, אם בשביל עבודה זרה שנקאת ‘צרה’, הלא אהבתי אישי יעקב ועבד בי ז’ שנים (לעיל כט, כ), ולבסוף נתן אבי לו את אחותי לאשה (שם שם כד), וקבלתי אהבתי לבעלי ומסרתי הסימנים לאחותי. אני בשר ודם – ואתה מלך רחמן על אחת כמה וכמה שתרחם עליהם, והקב”ה משיב “יש שכר לפעולתך ושבו בנים מארץ אויב” (ר’ ירמיה לא, טו). וביאור ענין זה כי בשביל שידעה רחל שיעקב ראוי שישא שתי נשים, כי אין העולם הזה – שהוא עולם החלוק והפירוד – ראוי שיהיה הכל באחדות, ואם לא היה ליעקב רק אשה אחת היו ישראל אחד, ולא היה יהודה מלאה ואפרים מרחל, כמו שלא יחצו לעתיד לימות המשיח, ומפני שראתה רחל דבר זה – קבלה באהבה, ולפיכך גם כן ראוי שימחול השם יתברך לישראל, כי מפני שאין האחדות בעולם הזה, ועדיין העבודה זרה בעולם – זהו שגורם לישראל לחטוא, שזהו מחסרון שהוא בעולם וממנהגו, ולכך רחל היא מבקשת רחמים, שהרי בה נראה שעולם הזה מסוגל שיהיה [בו] שניות וצרה בעולם הפירוד, שאינו מסוגל לאחדות. ספר שם משמואל פרשת וישב – שנת תרע”ב – מה גם יעקב אחר הבירורים שעשה מעשו ומלבן ונאמר בו כי שרית עם אלהים ועם אנשים ותוכל בודאי כחו יפה למשוך אליו מרחוק כנ”ל. אך שוב הי’ צריך יעקב שתהי’ עבודתו בבחינת שפלות והכנעה כדי לנקות את הבירורים כנ”ל. אבל הוא לא עשה כן אלא וישב יעקב, וכעין עוה”ב שנאמר צדיקים יושבים ועטרותיהם בראשיהם ונהנים מזיו השכינה, וזה הוא ביקש יעקב לישב בשלוה היא שלוה אמתית מעין עוה”ב.